Unversed- Those that are not versed in their own existence. They are called this because they are not their own beings, rather they are tied to Vanitas. Their existence it's well-versed. Unbirth- Those that are not born with their own existence. They would be called this because of their ties with Vanitas just like the Unversed meaning had to it. I personally think Normura could've renamed them to Unbirths based on the fandom. And the reason is it goes very well with "Birth" in "Birth By Sleep" just like "Heartless" fits very well with "Kingdom HEARTs". From time to time, I still like to call them Unbirths to be honest because I am a long time fan and it to me makes more since. I actually call them Unversed/ Unbirths. Anyways what do you guys think of how this could've went? Re: The name "Unbirth" still could've worked for Unversed enemies. Personally I was never to fond of either name. No enemy class in KH is if their own existence. •Heartless are someone's darkness running rampant. •Nobodies are someone's body running around on lingering memories. •Dream Eaters are born of dreams. •Unversed are born of Vanitas. But in hindsight I honestly can't think of a name for them that I'd consider fitting. From what I understand, "Unbirth" was their original name but was used very, very early on and the articles that mentioned them all but fell to obscurity. Some of the really early magazine articles talking about BbS were found and revealed that Unversed were in fact called "Unbirth" but that old name was rarely used. I'm not too keen on the name "Unversed" but I prefer it to "Unbirth". At least, for what we have now. Looking at the really early information for BbS it looks like we were going to get something very different (at least in some aspects) from what we ultimately got, so maybe "Unbirth" would have made more sense before, but now it's kind of nonsense. This is a child-friendly forum so I will be discreet, but unbirth is also...something else and that something is not pleasant. It wasn't a mistranslation. There are early BBS scans that say "アンバース" (Unbirths, mistranslated as "Ambers") but at some point in 2008 they switched to using "アンヴァース" (Unversed). I just spent 30 min looking at Japanese transcripts of Birth By Sleep scans and translators who made note of the shift from "Unbirth" to "Unversed". In fact, it seems like in 2008 Birth By Sleep's entire concept saw a bit of a shift away from what had been originally intended, not just the Unbirth/Unversed thing. Earlier trailers and interviews all convey a different, darker tone than what later interviews did. I don't think that describes the Unversed very well. They are quite literally Vanitas' emotions––extensions of him. They aren't even their own beings, which makes it impossible to be "unbirthed" which refers to unique beings that are not yet born. Like for example, "evil Terra"
If Terra was going to be a rival like Riku in KH 1 that would've been more epic than we have now! I doubt he'd have been a rival. 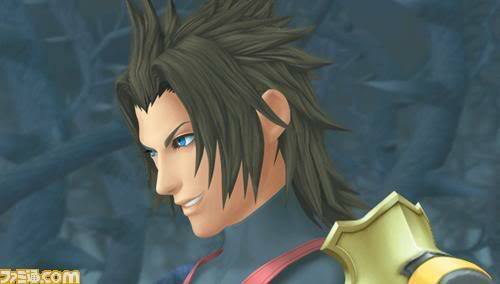 Unlike Riku, Terra in that early vid seemed perfectly fine of his friends. What's hinted, or at least originally theorized back then, is that Terra would just turn bad similar to the original Ansem concept. Evil!Terra was actually what I was thinking about while typing up my post xD It was my favorite concept from the earlier trailers. I know they probably didn't want to have Terra be too much like Riku, but evil-yet-morally-gray!Terra had much more intrigue going for him than gullible!unlucky!Terra (I still love Terra but damn 2008 Terra was perfect) I'll always wonder what he meant by Ven rescuing him. Imagine how much dialogue probably exists in the record banks from the old concept. I couldn't agree more, Evil-Terra was so much more interesting! ;A; I don't think he'd have been that much like Riku personally. It's always interesting seeing these old mockups and what coulda/woulda/shoulda. As for the enemy verbiage, I'm glad they didn't just force Unbirth(s/ed) on us simply because it's partially in the subtitle/themes of the game. For me, Unversed sounds and is spoken phonetically smoother and doesn't come with all the baggage Tinny alluded to. To be fair, "Evil Terra" could have just been a red herring from the early trailers. We might just have simply been reading too much into the look on his face. I do agree that him being a bit more morally ambiguous would have been interesting, though. But yeah, it's a shame about the whole Unbirth concept. The game is named Birth by Sleep, and really has next to nothing to do with "birth"--there are hints of it in the secret ending, but why name the whole game off of that? Something which wasn't even properly fleshed out at all. To think we're actually still waiting to find out what "birth by sleep" really is. The "Unbirth" were clearly meant to play into this theme somehow, but got watered down along the way. There is the presence of Sora's "unborn" heart in the game, so I've always looked at that as a clue for what they were originally intended to be. They were described to be the opposite of life---which could very well be death, or more broadly some state of being either before (like Sora) or after life. But there was that whole perception of this not being appealing to a Western audience due to it being grounded in Eastern thinking. Which is stupid considering we've got concepts like "Hearts can exist in everything" in the series. Combining that with what we actually got, that the Unversed were negative emotions, one possibility is that they were unresolved emotions from a person's life. But there was that whole perception of this not being appealing to a Western audience due to it being grounded in Eastern thinking. Which is stupid considering we've got concepts like "Hearts can exist in everything" in the series.